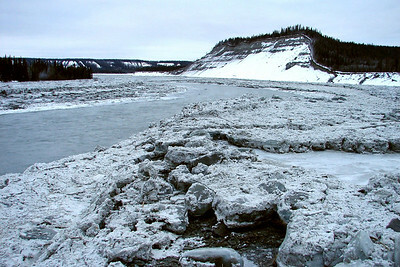 Around midnight on February 3, 2007 residents along the Tazlina River just south of Glennallen were awakened by a tremendous roar, a continuous noise that was broken only by the cracking of trees. Somewhere above Tazlina Lake a glacier had been undercut and a dammed lake had been turned loose. 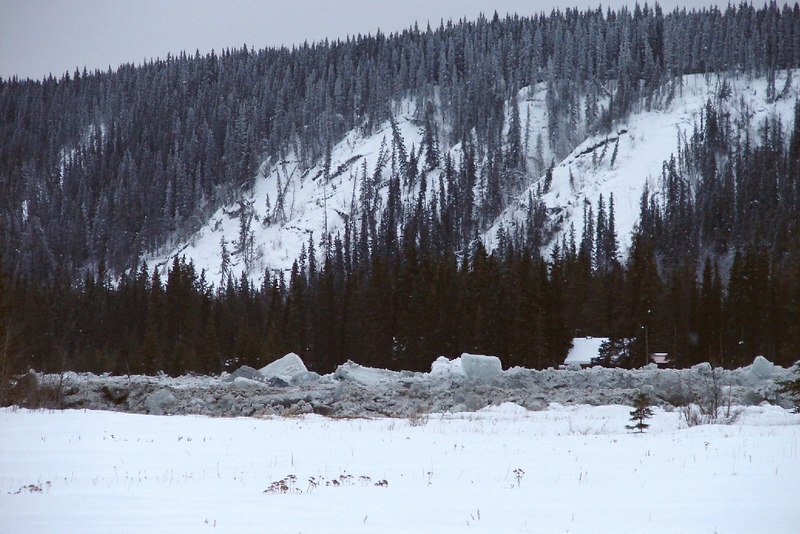 The surge of water lifted huge ice cakes and broke the frozen surface of Tazlina Lake and Tazlina River, sending it all cascading downstream, into the Copper River. 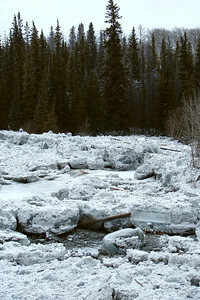 2/5/07 - Far upstream of the highway bridge, the river appears to be a stream of ice, while actually the river is open between the huge piles of icy residue. This, and the following photos, are best viewed in "Original" or "Large" size. Just move the cursor over the photo and click on Original or Large. A second click on the photo will return you to this view. 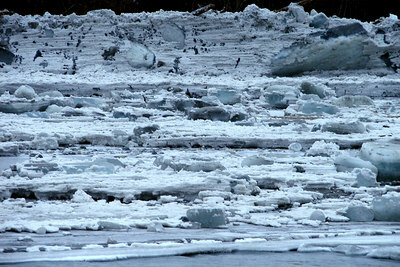 2/5/07 - Again looking upstream, blocks of ice deposited by the floodwaters rest on the gravel floodplain. 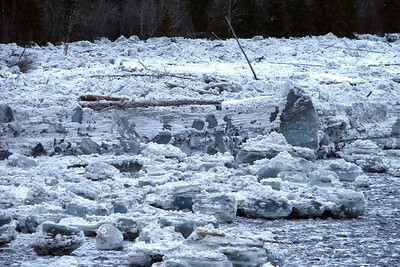 2/5/07 - The size of some of the ice chunks can be judged by the tree trunk wedged between a couple. 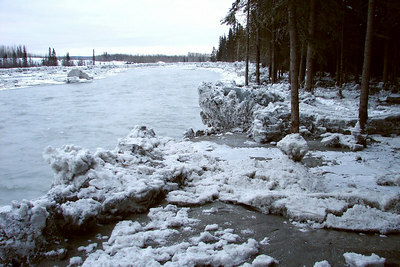 2/5/07 - While this house was beyond the reach of the ice itself, the driveway was flooded with ground-up ice floes and slush. 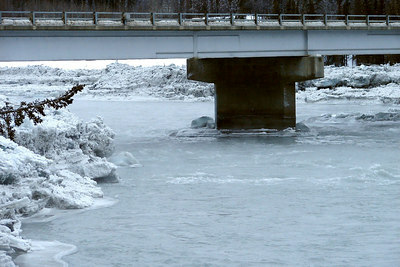 2/5/07 - Looking upstream under the highway bridge, the height of the piles of ice can be better judged. 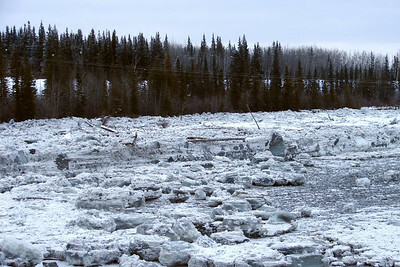 2/5/07 - Just below the bridge, a wall of ice reaching to the tree-lined cutbank on the left side of the river gives evidence of the maximum height of the surge. 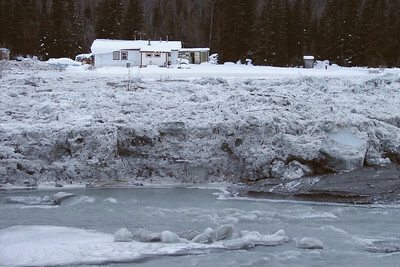 2/5/07 - The cutbank on the right side of the river just below the bridge received a heavy deposit of ice as well, as the river came at least 3 feet above the ground here. 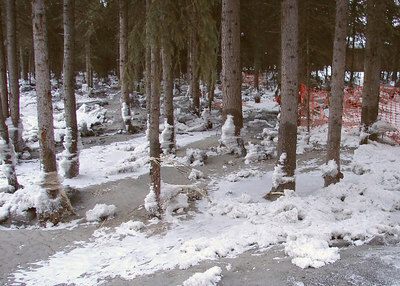 2/5/07 - Tree trunks show damage from the ice, as well as high water marks indicating the water may have been over 13 feet above its present level. 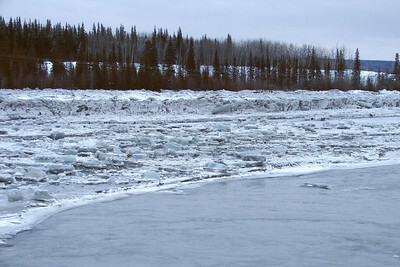 2/5/07 - Looking back across the river, the gouging of the fast ice by the blocks moving downstream can be seen clearly. 2/5/07 - Another view of the ice blocks that must have come from far upstream. 2/5/07 - A wider view of the preceding scene. 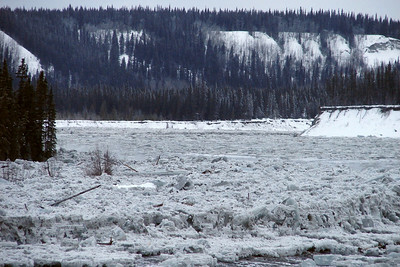 2/5/07 - Farther downstream, nearing the junction with the Copper River, the roof of a house nestled in the trees on the far side of the Tazlina can be seen above the ice ridge. One wonders what thoughts were going through the minds of the residents when the river was running amok.